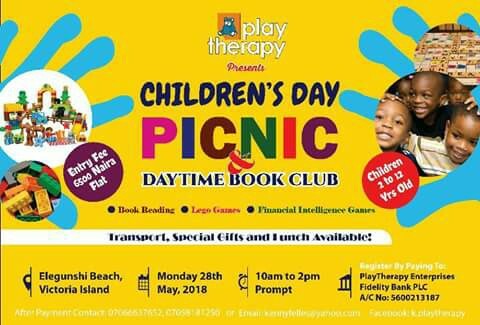 It's the Children's Day Picnic & Daytime Book Club as powered by Play Therapy. It's an event full of different fun activities for kids between the ages of 2 to 12 years. Some of these activities include Book Reading, Lego Games, Financial Intelligence Games and many more. Transportation, Special Gifts and Lunch will also be catered for in regards to the program.